The Manaslu Larkya Peak climbing with trek is one of our favourite treks and peak Climbing and we’d be delighted to help you explore this spectacular region in Nepal. The Larkya Peak climb (6249m - according to the N.M.A. ), also known as “Thulu Larkya La”, can be considered one of Nepal’s greatest trekking peaks for experienced climbers. Located in the Gorkha district of the Manaslu area, Larkya Peak offers views equally dramatic and breathtaking as the panoramas found in the infamous Everest and Annapurna regions - however, Larkya Peak is much less crowded. 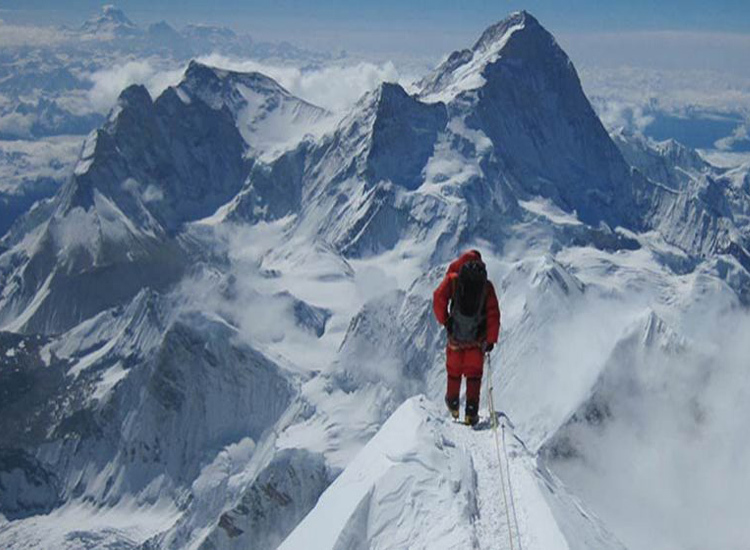 The official permits only became available to foreign climbers in Nepal, back in 2002. This exclusivity factor draws new climbers to Larkya Peak every year. Larkya Peak lies southeast of the Annapurna region and northwest of the Langtang region. On this immaculate road less traveled, climbers will find traditional villages rich in cultural heritage, and landscapes scarcely seen by the human eye. Clear in sight lies the great Mt. Manaslu, the eighth tallest mountain in the world. In addition to Mt. Manaslu, the Himlung Himal, Ganesh Himal, Annapurna, and other magnificent peaks are full in sight from the Larkya Peak climb. Larkya Peak has three summits: two false summits - Sano Larkya Peak, and Larkya North - and the true summit called Thulu Larkya Peak. This climb will be to the true summit of Thulu Larkya Peak. To begin each of these expeditions, a remotely beautiful trek will bring climbers through the vastly expansive Manaslu area. Thulu Larkya Peak is a technical climb and physical challenge, however, an experienced guide will be there to accompany and offer any necessary assistance. The best season for climbing Larkya Peak is from March to May or from September to December. Some of the more advanced climbers may wish to climb in the off season, but the safe, established times to climb are in the milder months of Spring and Autumn. Accommodation will be provided in both teahouses and camping, depending on location. It is important to note that Thulu Larkya Peak is a technical climb, and is classified as a group “A” expedition, according to the N.M.A. (Nepal Mountaineering Association). This means the Thulu Larkya climb is challenging in terms of physical and mental endurance at a high altitude. It may be noted that Larkya North (6200m), and Sano Larkya (5807m) are also great options for climbers, who may prefer a milder route than the expedition to Thulu Larkya (6416m). Larkya North and Sano Larkya also provide a rich experience for peak climbing in the Manaslu area, without the advanced technical challenge of Thulu Larkya. Altogether, the three Larkya Peaks provide their own thrilling expedition, suitable for climbers of varying levels and goals. All in all, Larkya Peak is a very rewarding expedition with astonishing views of the surrounding Himalayan peaks and valleys. Highly trained, experienced guides are there every step of the way. Guides are excellent with accommodating for the varying skill levels of climbers, optimizing the best experience possible for each individual climber. Considering the incredibly unique experience available from this road less traveled, the handful of pioneers who have climbed Larkya Peak might say that this truly is one of the greatest Himalayan climbing peaks in Nepal, today. In this respect, the climb to Larkya Peak is still one of Nepal’s best kept secrets. Himalayan trek commence with scenic drive to reach Soti Khola following the Prithivi highway that lead to Pokhara till Dhading, after turn off the road and take the road which is decreasing in width and comfort. We will enjoy the beautiful sight of typical Nepalese houses, Buri Gandaki River, valleys and so on. By leaving the main settlement like Arughat, Arkhet Bazar and Khyorpani, finally we reach to Soti Khola. The initial day of the Manaslu Circuit trek begin with gentle walk through the mule track, after climb on perilous steps blasted into a cliff face before dropping down to Lyabrubesi. We continue our trek to Nauli Khola and cross the suspension bridge. From there we follow the Buri Gandaki and reach at Machha Khola. We follow the original route which goes through the river to Khorlabesi and the warm spring at Tatopani. From here we follow the route lead from eastern bank of Buri Gandaki to Doban, Thulo Dunga and Yara Bagar. The trail lead back and forth across the river and reach a suspension bridge. Finally enter the gateway to the Manaslu Conservation Area at Jagat. (Enter Restricted Area)Trek begin with ascend to Sirdibas and continue to Philim. The terrain become increasingly arid as the trail snakes past waterfall to reach the Ekle Bhatti. As we trek forward, the road turnoff to Lokpa on the trail to Tsum Valley and climb above the confluence of the Buri Gandaki and Shar Khola to Pewa and further short walk bring us to Deng. From here we enjoy unique geographical formation. From here we follow side trail of the stone curving village of Bhi, we continue the Buri Gandaki until we reach the Bhijam and pass through the side trail from Bhijam to the Buddhist village of Pork. Soon, we drop to Ghap and continue climb up to Tom Khola to Longa Chuta. We then enter an enchanting forest of fir and rhododendron full of birds, langur monkeys on the north bank of the Buri Gandaki and we cross back to south bank and further short walk bring us to Namrung. We enjoy another the huge cultural difference comparing to previous days. From here we follow the route beyond the Namrung and climb up to the Upper Nupri where the dialect changes to a form of Tibetan and most people dressed in Chu bas, the Tibetan-style wraparound cloak. We then past the village of Barsam, Lhi, then turn off the route to the series of monastery and the base camp to ascend Himalchuli (7893m). We continuous across a series of valleys, passing trail to more rural gombas and reach at Sama. We trek towards the high camp today early and set up the camp at high camp for the final summit push the next day. A very early start today for our final summit push to Larke Peak at 6249M. The view of the Manaslu range will be a reward from the summit along Manaslu North (7157M). We will descend back to the base camp after the summit and continue to Bimthang. The day can be regarded as one of the most challenging days of the whole trek. After climb for a short while, we get spectacular views of Larkya Peak and Cho Danda. As we ascend towards the trails becomes steeper. We are greeted with amazing views of HImlung, Cheo and Annapurna II from the pass. We continue our towards Bimthang from here with the view of Manaslu. We head towards Dharapani where the trail passes through the dense forest and fields slowly coming into sight. Arriving in the Manang district, we are in the restricted part of the Manang after Nar Phu. We continue our trek further down to Tilje. We start up early following the trail to Dharapani. The Marshyangdi valley can be seen with the terraced fields and villages as the trails descends through the forest of pine and rhododendron that ultimately leads us to Syangje. From Dharapani we drive to Kathmandu via Besi Sahar. The first few hour of drive will be bone-shaker but later we have a smooth and relaxing drive to Kathmandu. Tipping is, Since the 1960s when trekking in Nepal was developed, there has been a tradition for groups and independent visitors to tip their crews at the end of a trek but tips are not included in the trip price.